French composer Francis Lai is perhaps best known for his breakthrough song Un homme et une femme from the 1966 film of the same name. 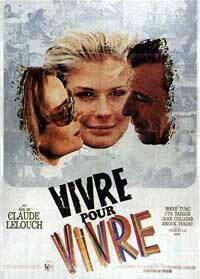 Lesser known, however, at least in the States, is the film from the next year called Vivre pour Vivre (Live For Life). It was the second collaboration between Lai and Un homme et une femme director Claude Lelouch. This film is incredibly hard to come by in America; Netflix doesn’t offer it. Amazon offers a Russian! import . And, at the time of this writing, eBay has a single listing for it on PAL DVD. It’s entirely possible that it hasn’t seen any kind of release in the U.S. since the original 1967 debut, which seems odd since it was nominated for an Academy Award and won a Golden Globe. The music itself was also nominated for a Golden Globe but lost to Camelot. For this score, Lai composed a specific theme for each of the main characters: Robert, newscaster; Catherine, his wife; and Candice, his mistress (played by Candice Bergen of all people).